Application is another term for software program; basically a program you use on a computer, like Word, TurboTax, Outlook, etc. ASCII means American Standard Code for Information Interchange. a commonly used data format for exchanging information between computers or programs. A measurement of a data line's transmission speed, or the amount of data a network can transfer from one computer to another in a given amount of time. BIOS means Basic Input/Output System. This term is used to refer to ROM BIOS chip inside the computer. This chip starts and manages the computer bootup process. A bandwidth term that means a data line that will allow large amounts of data to be transferred very quickly. Basically a broadband line will be much, much faster than an old dial-up line. To “burn” a CD or DVD means to write data files to it using a special piece of hardware. Cache is another type of memory kindred to RAM. The computer uses cache to quickly move data between the RAM and the CPU. A CD-ROM drive reads data from a disc. These CDs look like a music CD, but hold data instead of music. CD-ROMs also contain games, dictionaries, recipe files, and lots of other things that you can load onto your computer. A type of computer chip which is able to operate with a very small amount of electricity from a battery. The term also refers to the contents of a CMOS chip within the computer, which holds information about the computer boot devices, the date and time and its peripherals even while the system is turned off. Control Panel is a program that allows you to change settings in a program or change the way a Mac looks and/or behaves. The CPU, means Central Processing Unit, is the brains of the computer. Most new Windows based programs use a Pentium processor or a AMD Athlon XP. New Macs use a different type of CPU called Power PC. Virtually all computers come with a disk drive that can read and save information on portable diskettes, also called floppy disks. You can use floppy disks to save information or to load new software onto your computer. Folder is an electronic subdirectory which contains files. The hard drive is also called the hard disk. You'll probably never see it because it is nestled inside your computer. It's the computer's electronic filling cabinet, and it stores the computer's operating system, files, programs and documents. Just like a typewriter keyboard, this device is the primary way of inputting data into the computer programs. This is the clock speed of the microprocessor. The higher the number, the quicker the information is processed. MHz relates to how many millions of instructions can be processed per second. This mechanism connects a computer to a phone line so information can be sent from one computer to another or the user can access an on-line service or the Internet. In view of the popularity of the Internet, a modem is now considered basic equipment and comes on practically all-new computers. Monitor is an output device that allows you to see what you are doing. Most computers come with 14 or 15-inch monitors. This size is good for most people's needs. Larger 17 or 21-inch monitors also are available. The board inside a computer that allows all of the internal computer components to interact. Some would call it the "heart" of the computer. It routes data to and from all the other parts, including the CPU chip, the RAM, the power supply, etc. The mouse is another input device that makes getting around in your computer easier. It is a handheld object that is good for doing tasks such as moving and pointing to objects on the screen, and can replace the function and control keys of the keyboard. This is the circuitry or device that holds information in an electrical or magnetic form. There is read-only memory (ROM), which is information primarily stored on a disk, and random-access memory (RAM), which is chip-based storage inside the computer. Memory is typically measured in megabytes (MBs). RAM stands for Random Access Memory and is used generically as “memory”. This is the memory on a computer that allows you to hold and run a program so that you work with it on the monitor. More RAM is better. ROM means Read Only Memory. Usually seen in conjunction with BIOS, as in ROM BIOS. A chip onto which the information is permanently burned. Also denotes memory that can be accessed and read, but not written to. Operating system is the basic software that a computer runs on. Windows 98, Windows XP, Windows Vista, Window 7, Linux, Unix, and Apple’s Mac OS X Leopard are all operating systems. This is a general term for computer add-ons like printers, mice, keyboards, scanners, monitor, etc. Printer is an essential part of the computer if you want a hard copy of your work. There are four types of printers on the market: dot matrix, inkjet, bubble jet and laser. The dot matrix is the most basic. Most inkjets and bubble jets can print color and graphics, and a laser printer offers the best resolution at the highest speed. A scanner is a useful accessory to have if you are working with lots of artwork or photos. This device can copy written documents, pictures or photographs directly into your computer. There are three types of scanners: handheld, hopper-feed and flatbed. This device allows your computer to reproduce music, sounds and voices. Make sure you have a sound card if you're planning to play multimedia games. The video card is the part of the computer that sends the images to the monitor. Compiler is a program the converts programming code into a form that can be used by a computer. MB - short for megabyte. Gig - a Gigabyte = 1024 megabytes. Well there you have it, a Basic of Computer Terminology i.e basic computer terms. "Computing has become so vast and complex that the terminology associated with it is enough to populate entire dictionaries. It isn't necessary to be an expert in order to interact with a computer, but understanding Basic Computer Terminology is important." Simple and well explained basics of computer terminology. Thanks for this post. Very helpful to understand basic computer terminology. Lovely. 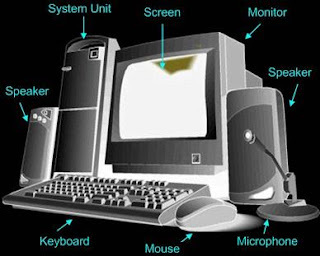 Easy to Basic computer terminology.